Our research is examining the evolution of what we have called ordered or authoritarian populism. This is a fairly recent and powerful force redefining the nature of politics in much of the advanced western world. The issue of immigration is receiving increased public salience and is at the forefront of much of the authoritarian populist movements. We intend to connect shifting attitudes to these broader forces and the survey we have just completed includes several indicators designed to measure that outlook. We will be presenting these in the coming weeks but our purpose here is to focus on attitudes to immigration in general, and attitudes to immigration shaped on race. These attitudes are very much entangled in the broader ordered populist outlook and that outlook strongly predicts these attitudes. It also increasingly predicts voter preferences and it represents a very different dynamic than what we have seen in the past. The traditional left-right axis has been transformed into a new contest about the future. The desire to restrict immigration and, in particular, immigration of non-whites, is an expression of this authoritarian reflex which has produced increased hostility to outgroups and a vocal desire to curtail immigration, particularly non-white immigration. What is extremely important is to note that opposition to immigration in general – and visible minority immigration in particular – is not up dramatically. What is dramatic is the level of ideological and partisan polarization on this issue. This also connects to similar irreconcilable differences on a range of other key policy issues that will be at the core of the coming election. Immigration attitude have become much more polarized and our research suggests that they are sorting voter choices in ways that we have never seen before in Canada. The two questions on immigration are part of a long-term tracking program that we have conducted for about 25 years. A couple of critical points are evident in the chart below. First, opposition to immigration in general is up somewhat, but lower than in the mid-90s. What is up more significantly is opposition to the incidence of immigrants who are members of visible minorities. Recognizing the difficulties associated with the term visible minority, we retain the term in order to not disrupt the long-term tracking. We also note that in our experimental testing the term ‘non-white’ produces the same results as visible minority. 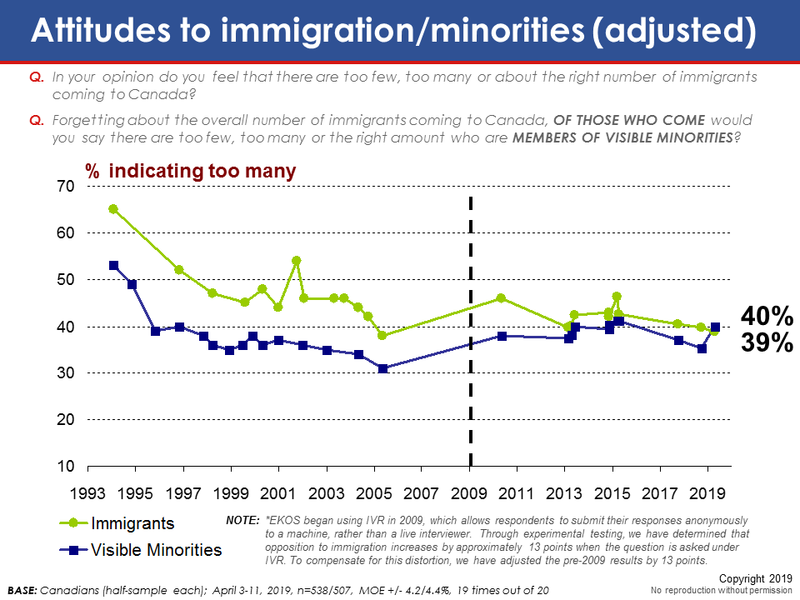 While general opposition to immigration is not that different over the past several years, the incidence of those thinking there are too many visible minorities is up significantly and no longer trails opposition to general immigration (as it has historically). Racial discrimination is now an equally important factor in views about immigration than the broader issue of immigration. We pointedly asked the second question independently of the levels issue. It asked respondents to consider the incidence of those who were coming who weren’t white. The broader concerns about job competition, pressure on social programs, etc., are not as much a factor at play in this test. While these shifts are interesting and significant it is the heightened polarization which is the more important finding. The next graph shows the tracking of answers to this question by party support. We can see that things are vividly different today than in the recent past. Whereas there were modest but significant differences in the past between Conservative and other voters, these have increased dramatically. The biggest gap is the yawning divide across Liberal and Conservative voters; from a fairly modest 47/34 in 2013 to a huge 69/15 in the most recent poll. This massive divide is also sorting voter choices in our related analyses in ways that it never did in the past. We believe that these shifts are a reflection of a wider shift which has seen an ordered populism emerging in Canada, as it has in many other advanced western societies. This has been seen as a ‘cultural backlash’ by Norris and Inglehart or the resurgence of an authoritarian outlook noted by Stenner and Haidt and several other important academics. The key drivers are economic stagnation and the burgeoning acceleration of inequality at the top of the economic pyramid, a sense of loss of privilege and identity status and a magnified sense that the external world is newly threatening. This view gives precedence to obedience over creativity (when raising a child), morality over reason, good behaviour over questioning authority. It is linked to stronger support for increasing police powers to deal with security, anti-globalization sentiments and a general desire to pull up the drawbridge and return to a ‘greater’ more secure past. It also very strongly linked to deep reservations to immigration, particularly non-white immigration. It is quite different from traditional status quo conservatism or small government, free market conservatism. It is an extremely emotionally powerful force and it is clearly at work in Canada as it is in other western countries. Understanding these forces and the correct public policy responses is a central challenge. So far, this has been a puzzle which has eluded most of the societies where it is unfolding. This survey was conducted using High Definition Interactive Voice Response (HD-IVR™) technology, which allows respondents to enter their preferences by punching the keypad on their phone, rather than telling them to an operator. In an effort to reduce the coverage bias of landline only RDD, we created a dual landline/cell phone RDD sampling frame for this research. As a result, we are able to reach those with a landline and cellphone, as well as cellphone-only households and landline-only households. The field dates for this survey are April 3-11, 2019. In total, a random sample of 1,045 Canadians aged 18 and over responded to the survey. The margin of error associated with the total sample is +/- 3.0 percentage points, 19 times out of 20. Please note that the margin of error increases when the results are sub-divided (i.e., error margins for sub-groups such as region, gender, age, education). All the data have been statistically weighted by age, gender, and region to ensure the sample’s composition reflects that of the actual population of Canada according to Census data.